When you need a sweater that will never go out of style, try a hip-length turtleneck with braids and rope cables. 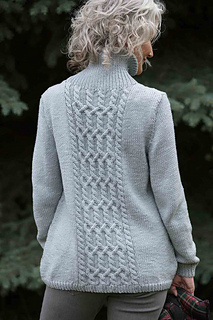 Although the inhabitants of Skellig Michael never knitted—Irish monks left the site before knitting reached Ireland, and birds have trouble holding yarn—this sweater’s subdued color and dramatic stitchwork bring to mind the island’s famous beehive cells and stone stairways. Finished Size 34.75 (37.5, 42.25, 47, 50.75, 54.5)“ bust circumference. 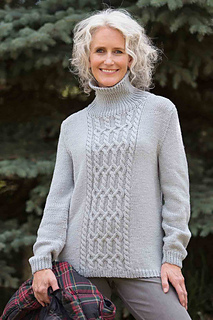 Pullover shown measures 37.5”; modeled with 1.5” of positive ease. Yarn Sugar Bush Yarns Bold (100% wool): #3017 silver islet, 6 (6, 7, 8, 9, 10) balls (see Notes). Needles Size 7 (4.5 mm): 32” circular and set of double-pointed. Size 8 (5 mm): 32” circular. Adjust needle size if necessary to obtain the correct gauge. Notions Markers; stitch holders; cable needle; tapestry needle. Gauge 17 sts and 22 rnds = 4” in St st on larger needle; 44 sts of Cable panel = 6.75” wide on larger needle. 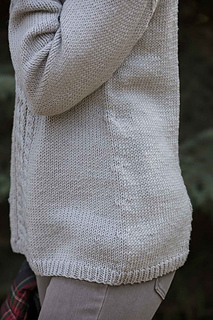 Notes The body of this pullover is worked in the round from the lower edge to the underarm, then the upper front and back are worked separately back and forth. The sleeves are worked flat and seamed. The sample used almost all of six balls of yarn. 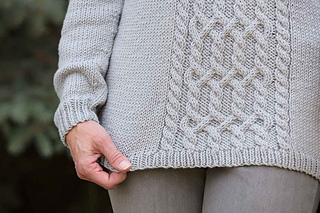 Consider purchasing an extra skein as insurance.